Two sections, a text on cosmography and geography. By Rav Avraham ben Mordechai Pritzul. 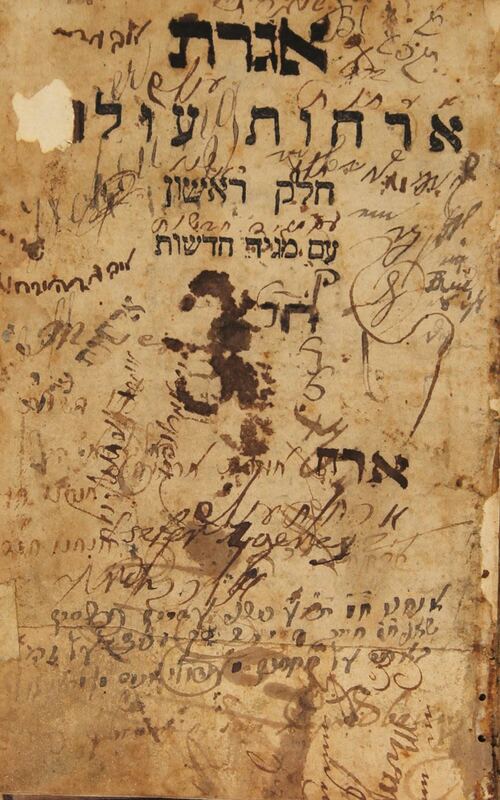 At the end is the letter of Yemen to the Rambam and Yesod Moreh and Sod Torah of the Ibn Ezra. This is probably the first Jewish geographic book, dealing in Hebrew with the discovery of America, Africa south of the Sahara, and the geographic discoveries there, and the Jews of Ethiopia (the Beita Yisrael). 30 chapters in the book deal with various countries with an emphasis on Jewish settlements in each. Chapter 14 is dedicated to the Ten Lost Tribes of Israel. The book is accompanied by 3 wonderful engravings. | Rav Avraham ben Mordechai Pritzul (1451-1525) was an Italian talmid chacham, a polymath of the Renaissance period. He arranged a debate with priests in Ferrara. Following this pamphlet, he authored the Magen Avraham. Signautres and ancient listings of ownership. Partially disconnected binding. Cover, 3 first and last pages are missing. , 1-95 pages. 16cm. Generally good condition.